The Stanford Axe is a trophy awarded to the winner of the annual Big Game, a college football match-up between the University of California Golden Bears and the Stanford University Cardinal. The trophy consists of an axe-head mounted on a large wooden plaque, along with the scores of past Big Games. Stanford has held the Axe since 2010, most recently retaining it after defeating Cal 23-13 in 2018. Give 'em the axe, the axe, the axe! Give 'em the axe, where? Right in the neck, in the neck, in the neck! Right in the neck! There! The Axe made its second appearance two days later on April 15, 1899 at a Cal-Stanford baseball game played at 16th Street and Folsom in San Francisco. 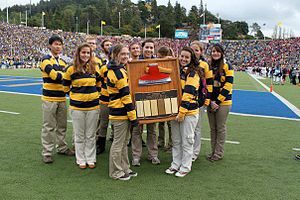 Led by Billy Erb, the Stanford yell leaders paraded the Axe and used it to chop up blue and gold ribbon after every good play by the Stanford team, while shouting the Axe yell. However, Stanford lost the game and the series, and the yell leaders debated if the Axe was a jinx and whether to dispose of it. As Stanford students discussed the Axe's fate, a group of Cal students seized it and ran off with the Axe. It in turn was passed from student to student, and a chase ensued through the streets of San Francisco, first followed by Stanford students and fans and second followed by the San Francisco police. During the chase, the Axe's handle was broken off. For the next 31 years, the Axe stayed in Berkeley as a prize of conquest. In 1930, twenty-one Stanford students plotted to take back the Axe from Cal. This group became known in Stanford lore as the Immortal 21; Cal partisans call them the Immoral 21. For three years after the raid on Berkeley the Stanford Axe lay in a Palo Alto bank vault while both universities decided what to do with it. In 1933, both sides agreed to designate the Axe as the annual trophy to be awarded to the Big Game's winner; in the event of a tie, it would be kept by the side already possessing the Axe. However, the agreement did not stop students from both schools from stealing (or attempting to steal) the Axe. Since 1933, Cal students have stolen the Axe three times and Stanford students four times; the most recent incident occurred in 1973. On January 28, 1978, a group of Cal students paraded a carefully constructed replica of the Axe across the court of Stanford's Maples Pavilion during the Cal-Stanford basketball game. This "Fake Axe" stunt led to erroneous reports in the following day's papers that the Axe had been stolen, therefore some sources report 1978 as the most recent theft. Depending on which school holds the Axe, the trophy's recorded score for the 1982 Big Game is changed. This is part of the continuing dispute surrounding The Play, the last play in the final seconds of the 1982 game, which ended with a kickoff return marked by five laterals, the Stanford Band thinking the game was over and rushing the field, and then a touchdown run through the band featuring the last Cal returner bowling over a Stanford trombone player in the end zone. Referees declared the touchdown as legal and California the winner of the game. However, Stanford contends that one of the five laterals on that play was an illegal forward pass and that a Cal player was tackled before he lateraled the ball. As a result, whenever Stanford wins the Axe, the 1982 score is changed on the trophy from "California 25, Stanford 20" to read "California 19, Stanford 20." Despite this practice, the official score must be on the Axe prior to the start of each Big Game no matter who has it at the time. When Stanford has the Axe, it is guarded by the Stanford Axe Committee and kept in a secret location, when not on display in the lobby of the Arrillaga Sports Center. When California is in possession of the Axe, the Chairman of the UC Rally Committee acts as its custodian. It is generally displayed in the lobby of the Martin Luther King Junior Student Union Building. During the Big Game, the Stanford Axe is displayed by the school that won the Big Game during the previous year. The Stanford Axe is transferred at the Big Game during what is known as "The Stare Down." With two minutes remaining in the Big Game, the Stanford Axe is brought to the 50 yard line, where members of the UC Rally Committee and the Stanford Axe Committee wait until the end of the game to determine who will take the Axe. Once the game ends, the winner of Big Game takes possession of the Axe until the next Big Game is played. Currently, Stanford has the Axe after winning the 121st Big Game on December 1, 2018 by the score of 23–13. Although Stanford leads the all-time series before and after the use of the Axe as a trophy, California still has held the Axe for a longer amount of time due to their 31 year possession before the recapture of the Axe by Stanford. During the time the Axe has been used as a trophy, Stanford has held it 47 times to California's 35. ^ R. L. Templeton; Clinton R. ("Brick") Morse; Norman Horner; Wagner d'Alessio. "The Stanford Axe". Retrieved 19 November 2013. ^ a b Alkire, David (18 November 1966). "Operation 'Immortal 21' Highlights Spirited History of Stanford's Axe". The Stanford Daily. 150 (41). Retrieved 15 March 2016. ^ San Francisco Examiner, Sunday January 29, 1978. Wikimedia Commons has media related to Stanford Axe.